Residents of Liberty Township were asked to move to the hallway if they were not sitting in a one of the provided chairs in the main hall. Speakers who found themselves in the hall had to fight their way through the crowd to the lectern to speak. 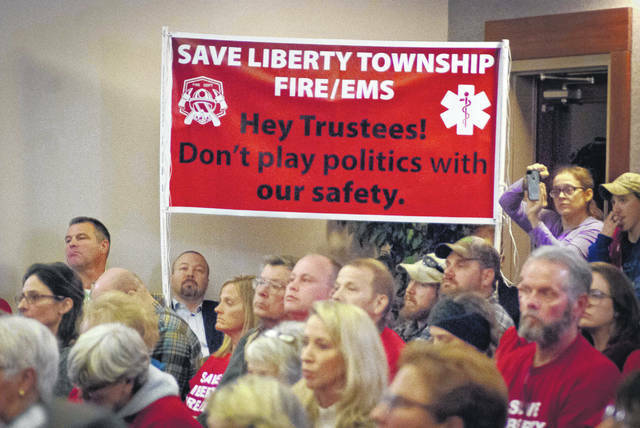 Liberty Township residents crowded into the township hall Monday night to voice their opposition to the trustees turning over control of the township’s emergency medical services (EMS) to the county. 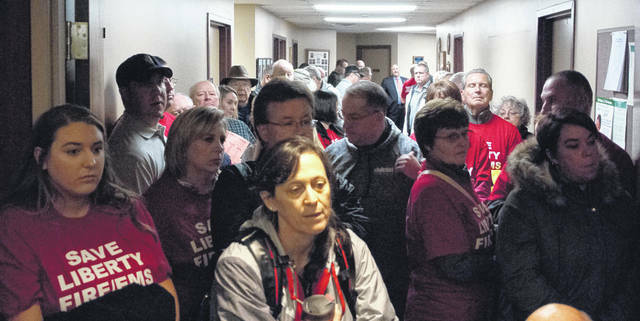 According to organizers, approximately 15,000 people attended or watched the regularly scheduled Monday trustees meeting either in person or via Facebook Live. According to organizers, approximately 15,000 people either attended in person or watched via Facebook Live the regularly scheduled Monday Liberty Township Board of Trustees meeting. Residents in opposition to turning over the township’s emergency medical services (EMS) to Delaware County EMS urged trustees to keep control of the service. Once residents had spoken, Eichhorn mentioned that the board did not hear from one person in favor of turning the township’s EMS over to the county. Eichhorn then made two different motions on resolutions to slow the process of the proposal going to a vote. In a moment of deja vu, trustees Melanie Leneghan and Mike Gemperline remained silent, refusing to second the motions. During the Nov. 29 Delaware County Board of Commissioners meeting, commissioners Gary Merrell and Jeff Benton would not second a motion from Commissioner Barb Lewis to rescind the resolution that sent the proposal to Liberty Township trustees. When Gemperline refused to second Eichhorn’s motion, residents called him a liar and began calling for his resignation, citing he was not keeping his campaign promises to keep EMS. During the discussion, Battalion Chief William “Bill” Piwtorak, Liberty Township Fire Department, approached the lectern to clarify comments that he said had been stated incorrectly by Leneghan. “One — it was not a vote (by) the county (voters), it was (a vote by) the commissioners,” he said. Leneghan had said that the voters of Delaware County approved the one half of one percent sales tax partially used to fund the county EMS. According to Delaware County Auditor George Kaitsa, as of Friday, Nov. 30, the county has collected $22.1 million this year from the o.5 percent permissive tax resolution signed by commissioners on Nov. 15, 1971, as an “Emergency for the preservation of the public peace, health and safety,” as stated in the resolution. Piwtorak said that Delaware County EMS “come in non-emergency” situations. Piwtorak then made his final statement to Leneghan. Piwtorak received a round of applause from residents following his comments. Schuiling said his department is looking at other models available, and the opportunities between the county EMS and Liberty Township. Schuiling said there are many inefficiencies in the county system as it continues to grow. Dr. Warren Yamarick, the township fire department’s medical director, gave his thoughts on a two-paramedic ambulance. “It was a joke for you to say that a two-man medic would be equal to or better than a three-man medic,” he told Leneghan. “We are a team of firefighters and EMS, a three-man medic is a hell of a lot better than a two-man medic. Yamarick said the trustees have never reached out to him on the matter of switching to the county service. During the regular scheduled business portion of the meeting, Leneghan tabled a resolution that would have appointed Yamarick to continue as medical director in 2019 as per the township’s statutory obligation under Ohio Revised Code. She also tabled a resolution to hire an additional part-time firefighter/paramedic. Leneghan told the residents that there would be at least one more meeting for discussions before a presentation is made indicating the direction trustees plan to move on the proposal. She said that discussion would take place at the trustees’ next meeting on Monday, Dec. 17. Gemperline said he thought that both the county and the township need to agree to work together to find ways to improve the current service. Gemperline said he had talked with Schuiling and Liberty Township Chief Tom O’Brien, both of whom said they could meet and discuss the needed improvements in services and how to save some money at the same time. “Worst case scenario, I think that’s going to happen and it’s going to benefit us,” Gemperline said. This entry was tagged D. Anthony Botkin, Delaware County EMS, Liberty Township Fire and EMS, Melanie Leneghan, Michael Schuiling, Mike Gemperline, Piwtorak, Shyra Eichhorn, Yamarick. Bookmark the permalink.